Bitcoin was created in 2009 by a mysterious character who claimed it to be a payments network. But unlike most other payment networks like PayPal and Visa, it screwed with our minds by having its own token. A token that had a price that floated against other currencies. In basic terms, this means if you fund a bitcoin wallet to buy something, it may be worth less (or more) by the time you come around to spending it. This is the story of bitcoin volatility, we’ll be studying its personality over its short and notorious history. It was partly inspired by Vinny Lingham who calculated Bitcoin will achieve the necessary price stability to be a store of value at $3000 per coin (~$50b market cap), and estimated that to be two year away. We shall see if the data backs this up. We’ll start this journey with a bit of eye candy. 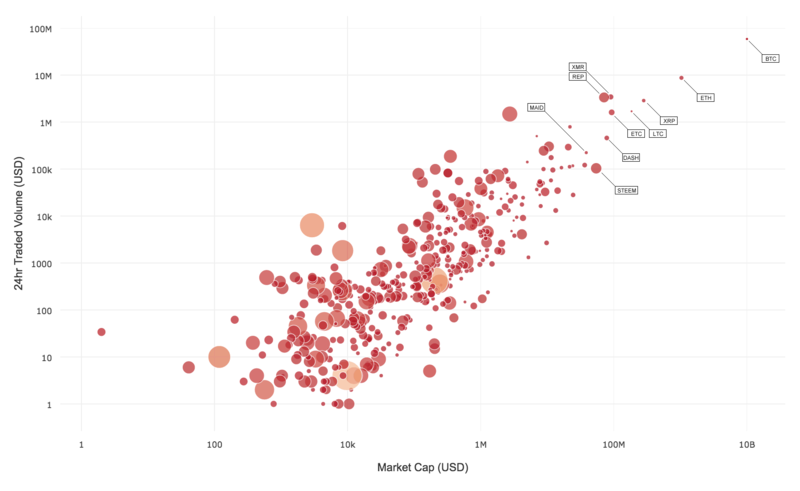 Let me plot for you the volatility of 600 cryptocurrencies against their market caps and 24 hour traded volume (i.e. liquidity). Volatility is represented by the size of their circle. Okay circles, I want you to be small and towards the top, got it? (This equals low volatility and high liquidity). As it turns out it was a weak correlation between market cap and volatility. Apart from looking real nice, it showed just how far ahead bitcoin is over the other coins. Pundits should know I used log scales and exponentially scaled circles to reduce the exaggerated differences here. Onwards to the real focus of this study… Dearest Bitcoin, how long will it take for you to be as stable as fiat currencies? To answer this, I collated 5 years of bitcoin price data against USD (BTCUSD) and compared it to EURUSD and NZDUSD currency pairs to produce this very telling graph. 60-day volatility are used in these plots. 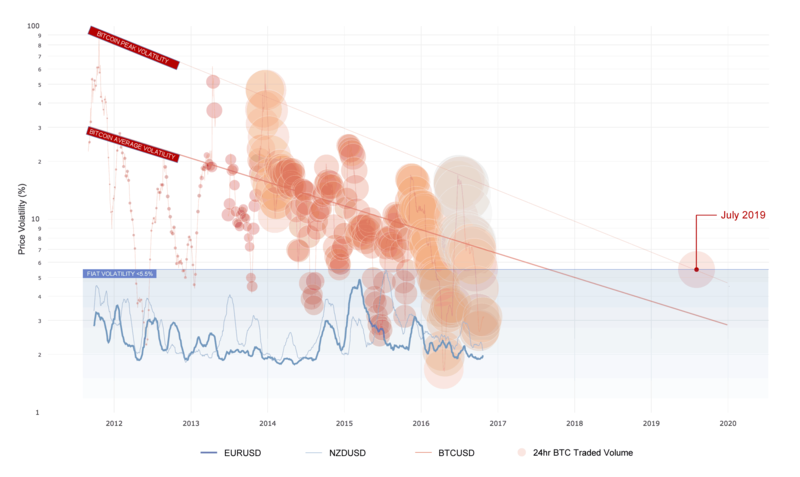 What we are seeing is bitcoin’s peak volatility is reducing steadily and will enter the realms of fiat currency (below 5.5%) by around July 2019. I found this surprising. For a currency with a tiny market cap of $10b, compared to say the Euro’s M1 money supply of $7.5t, bitcoin’s price stability is ridiculously good. Price stability is needed before we get consumers buying and holding bitcoins for short and medium term spending. When this happens, it’ll have a large and positive impact on price. The next 2 years of bitcoin will be bullish in this regard. Buying and holding bitcoin for native payments has a very different economic fingerprint than say via bitcoin as remittances, where the receiver of funds immediately sells to move back to fiat currency which is more stable. Remittances use bitcoin as a pass through token, or in other words it’s price neutral as remittance adoption increases. Ventures that focus on bitcoin as a form of payment are premature – examples include payment gateways like BitPay and cryptocurrency point-of-sales ventures Plutus and BlockPay. We are probably at least 2 years out from the necessary price volatility necessary for this sector to be ready. For now bitcoin HODLers are speculative investors. If I was a venture capitalist or an altcoin ICO investor, I’d be steering clear for a couple more years. Given bitcoin has by far the largest network effects and an exponential head start on stability and liquidity, I would say any other payment altcoin is going to have a hard time competing, especially in 2 years and we get a critical mass of sorts on the bitcoin network. Examples include the privacy coins and payment coins like ZCash, Monero, Dash, and other less known coins too many to list. FOOTNOTE: As part of this study, I found the bitcoin volatility information most people refer to, namely [btcvol.info](https://btcvol.info/) looks wrong. My volatility calculations put volatility around ~5x higher than this site. To double check my calculations my curves have been confirmed by comparing to the more official tradingview.com charts for FOREX. An economic comparison of payment coins, who is winning the race?